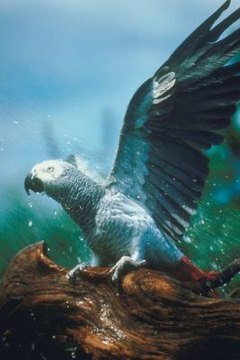 The African grey parrot (Psittacus erithacus) is commonly referred to as the red-tailed grey parrot or the African grey. The species is native to the western and central Africa, living in the lowland forests, savannah areas, woodlands and mangrove areas near the coast. The African grey thrives in areas where the climate has a moderate temperature and high humidity. When deciding where to put your African grey's cage, you want to make sure that the room you place his cage in will be maintained with proper temperature and humidity levels. The temperature should be between the high 60s and the high 70s Fahrenheit. The humidity level should be between 35 percent and 50 percent; if you live in a dry climate, you may want to set up a humidifier in the room to add moisture to the air.